Upgrading to an ebonite clarinet mouthpiece can be both expensive and tricky. 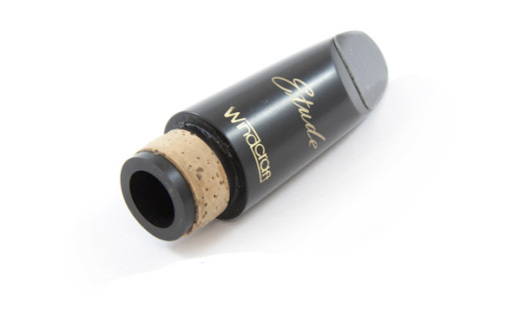 This excellent value ebonite clarinet mouthpiece is especially designed for the first upgrade. Made to a Windcraft / Weinberg design, it is free blowing and responsive with just the right amount of resistance for tonal development. They are made with subtle variations so that the young instrumentalist will always find a suitable personal choice. Produced from quality ebonite for a consistent finish and warm tone. Carefully designed for the advancing player (Grade 4+). Available on 14 day home trial. Our most popular ebonite clarinet mouthpiece. Mouthpiece appeared to be second-hand with worn nameplate, dirt above joint and cork joint very dry and flaking. NOT advertised as second-hand or used. The supplier responded:Many thanks for your recent purchase. We're sorry that the mouthpiece you received was not satisfactory for you and we're happy that we could resolve your issue promptly for you. The Etude is one of our most popular ebonite mouthpieces due to it's amazing value, consistency and easy sound production. Please accept our apologies that the particular example you received was not satisfactory for you. We do try to manually check each mouthpiece being sent out to customers to guarantee quality control and I can only imagine that one of our test mouthpieces was mis-picked and sent to you in error. Used to own a Vandoren B45 but alas it got damaged. Could not get on with the supplied mouthpiece with my new Yamaha clarinet . The Etude is every bit as good as the B45, not got the same finish perhaps but the notes run out like syrup and can play for an extra hour. Using a Legere 2.5 plastic reed with a BG ligature.